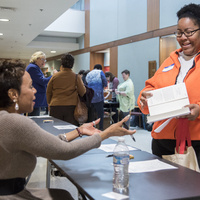 The 13th annual Kentucky Women’s Book Festival will feature local authors from a wide variety of genres Saturday March 2 on the University of Louisville’s Belknap campus. The festival sessions and presentations are free, except for an optional lunch. The festival begins at 9:00 a.m. with coffee and conversation and the opening session begins at 9:30 a.m. in the Brandeis School of Law. Luncheon registration is required. More details to be announced soon. The UofL Women’s Center and Brandeis School of Law are sponsors of this event.